This Short History of the Glebe Music Festival is reproduced by permission of the author, Dr E. David McIntosh AM AMusA, based on his presentation for Glebe Voices in 2012. 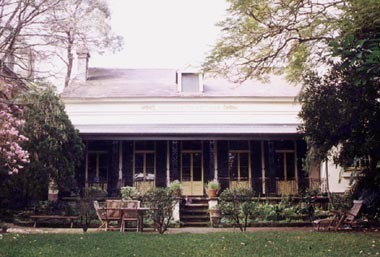 Margaretta Cottage in Leichhardt Street Glebe may have been built as early as the 1830s and is now the home of the Glebe Music Festival. The late Dr Vincent E. M. Sheppard purchased the property in the 1960s, preserving and restoring it for generations to come. Sheppard brought a Dutch chamber organ, which is thought to date from the late 17th century, to Australia in the 1950s. It is possibly the oldest organ in Australia and is now resident at Margaretta Cottage. Throughout the 1960s and 1970s its sound was central to the activities of the Organ Institute of New South Wales and subsequently the Organ Society of Sydney, the Twilight Recitals at Christchurch St Laurence, the Workers’ Education Association series on the organ, and recitals by the likes of Christopher Hogwood. The baroque sound became the inspiration for the drive to get a baroque organ for the Great Hall at the University of Sydney. In the 1980s, the Royal Alexandra Hospital for Children’s orchestra was formed and gave regular performances at Margaretta Cottage. Dr David McIntosh was a trainee paediatrician at the hospital at that time. A replica of a Ruckers Double Flemish harpsichord was built at Margaretta Cottage and opened by the late Geoffrey Parsons in 1989. The Tall Poppies record label was unveiled by Peter Sculthorpe, Geoffrey Tozer and Roger Covell at Margaretta Cottage. Sheppard died of cancer in 1987 and ownership of Margaretta Cottage passed to David. Amongst others, Fretwork and Olaf Bär rehearsed there. With the tradition of music-making and the keen audiences of Glebe, the inaugural Glebe Music Festival occurred in 1990. The very first “performance” was a reading of poetry in honour of St Cecilia followed by a musical performance of the Hamburger Sonata by CPE Bach. Highlights of the Glebe Music Festival have been, in no particular order, a Balinese gamelan, Andean groups Cantolibre and Andean Dreams, an African township jive band Jive Kayana, the identical Hungarian guitarist twins the Katonas, Nick Byrne the ophicléide player, Quantum Theory jazz, burlesque, and of course the US Marine Forces Pacific Band in 2005, not forgetting hundreds of classical music and choral performances. Two pop concerts and a rock concert should also be mentioned. At the request of the Glebe Society a series of “historical” concerts at the Great Hall started in 2001 with the re-creation of a Federation concert from 1991. This was followed by concerts to celebrate anniversaries (Vaughan Williams and Messiaen), a Pastoral Modes from England concert, another re-creation – a Sydney Philharmonia Society concert from the 1830s, and several other historically themed concerts, masterminded by David Miller from the Sydney Conservatorium of Music. For a number of years concerts were held in the historic Old Court House of Glebe, providing a unique opportunity to experience the ambience of this fine building. The Record Reign Hall and St John’s Church have also hosted concerts. The Glebe Music Festival would not happen without the stalwart support of the Glebe Society, Ted McIntosh, the Sisters of the Good Samaritan St Scholastica’s, David Gaunt and Roger Mackell from Gleebooks, Professor Kathy North AM and Rob Dowsett, and a host of others too numerous to mention. David McIntosh is the Artistic Director of the Glebe Music Festival and was awarded the Order of Australia in the Queen’s Birthday Honours list in 2011 for his services to medicine and music.